There is a lot of money to be made in trading, but like anything in life, you have to learn to develop your skills and take responsibility. I will admit I know very little about trading, other than what I see on the news. Gallina’s book, “#FMJ Trust Transition Trade” is one that is informative and encouraging for those of us, especially women, who want to start trading. 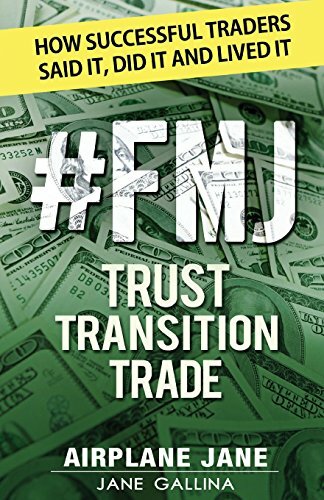 “#FMJ Trust Transition Trade” is a series of interviews/biographies of several women who became day traders from scratch, and through trial and error live financially independent today. Through the help of Timothy Sikes, the author learned about the pros and cons of day trading, what to look for and most of all be optimistic and learn all you can by watching the market, attend workshops and network with other traders. Many of the women in this book state that you have to learn about trading on a daily basis and be willing to take a risk and develop a strategy. I also found that you need to be willing to trade on a weekly basis, find time to watch the market and set aside money specifically for trading. Interestingly enough, but not surprising, there are very few women day traders, although that is changing. Part of the problem is that there is no one place where women traders can connect and discuss strategies, market ups and downs, or receive positive support from each other. “#FMJ Trust Transition Trade” is easy to read and provides great suggestions about some early low risk trading -- and don’t rely on friends for stock tips. One of the most important tips is you have to know yourself and don’t let negativity get you down. One of the cons for me while reading is there were some terms I didn’t understand and therefore didn’t comprehend what the author or women were talking about. I think it would have been a good idea to include a glossary on some of the basic terms. The author did include sections on Free Trading Tools, Recommended Books and You Tube channels to watch. Overall I found the book very informative and well written. If one is interested in learning more about day trading, “#FMJ Trust Transition Trade” by Jane Gallina is a great read.